La Jolla, CA – Scientists have identified three different signals that indicate damage to chloroplasts – the photosynthetic factories of plant cells that give plants their green color – but little is known about how the signal gets passed on to the nucleus. Scientists at the Salk Institute for Biological Studies made a big step towards explaining how chloroplasts let a cell’s nucleus know when things start to go wrong at the periphery so nuclear gene expression can be adjusted accordingly. Multiple distress signals converge on a single pathway and channel the information to a nuclear master switch, the scientists report in the March 29 issue of Science Express. In response, hundreds of genes involved in photosynthesis are simultaneously shut off to ease the chloroplast crisis. Plants must cope with many stresses. For instance, failure to respond appropriately to photo-oxidative damage in chloroplasts results in a bleached appearance of leaves. Photo courtesy of Ajit Nott. Plants store the bulk of their genetic information in the nucleus but chloroplasts and mitochondria, which act as cellular power plants, share some of the responsibility. Yet, chloroplasts and mitochondria contain thousands of imported proteins, which need to work hand in hand with the few that are encoded in the nucleus and others made locally. “Such an arrangement requires a tightly coordinated communication between organelles and the nucleus but not much is known about the signaling pathways between chloroplasts and the nucleus says the study’s lead author, Joanne Chory, Ph.D., professor and director of the Plant Biology Laboratory and investigator with the Howard Hughes Medical Institute. The basis of the study may provide insight into other areas of biological research. The importance of an unhindered flow of information to and from cellular organelles, for example, is illustrated by some types of cancer, in which the breakdown in communication between mitochondria and the nucleus contributes to the progression of tumors. The green chlorophyll in chloroplasts absorbs light’s energy, which not only results in the release of oxygen but is ultimately used to transform low-energy carbon dioxide from the air into high-energy compounds like glucose and starch. With chloroplasts being a plant’s basic lifeline, it is crucial for a cell to be informed about their functional state. In earlier work, Chory’s lab discovered that one important function of retrograde signaling – that is from chloroplast to nucleus – is to coordinate the biosynthesis of photosynthetic proteins manufactured in the chloroplast with those subunits encoded in the nucleus. These proteins are then assembled into functional complexes in the chloroplasts. In experiments done in the mustard plant Arabidopsis thaliana, the “lab rat” of plant biologists, they found that when chlorophyll precursor molecules accumulate in chloroplasts, hundreds of nuclear genes are turned down to shut off the choked supply line. Herbicides that inhibit protein synthesis in chloroplasts have the same effect. Under conditions of extreme light for example, when reactive oxygen species start to build up, plant cells actively reduce the size of the light-harvesting complex to relieve the oxidative stress. “To protect chloroplasts from damage by reactive oxygen molecules, a byproduct of photosynthesis in overdrive, chloroplasts tell the nucleus to cool it for a while,” explains Chory. While it was clear that all these different signals had to be transmitted to the nucleus to elicit a protective reaction, it was unclear just how this information traveled. 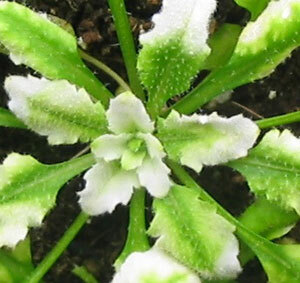 To start filling in the gaps, co-first author Ajit Nott, a former post-doctoral researcher in Chory’s lab and now a researcher at Pioneer in Hyderabad, India, searched the Arabidopsis genome for genes that allowed plants to react to chloroplast damage. His search turned up GUN1, short for genomes uncoupled 1, a nuclear encoded protein he could trace to specific domains within chloroplasts. No matter under which kind of stress the chloroplasts labored, all signals led to GUN1 before they were passed on to the nucleus. Co-first author Shai Koussevitzky, now a research associate at the University of Nevada in Reno, looked at the end of the signaling pathway: the nuclear genes targeted by retrograde signaling. He identified a short motif in the regulatory region of most genes targeted by retrograde signaling and pinpointed ABI4 as the corresponding binding factor. The work was funded by the Howard Hughes Medical Institute and a grant from the Department of Energy. Shai Kousssevitzky was supported by EMBO and the Howard Hughes Medical Institute, and Ajit Nott was supported by the Damon Runyon Cancer Fund.